Larry Ellison is an American entrepreneur, a talented software developer, and co-founder/executive chairman/CTO of Oracle Corporation, the world’s second-largest software company (after Microsoft). Furthermore, he is a stickler for sailing. In 2014 he decided to move from his role of CEO of Oracle, however, he didn’t leave his company, so he became an executive chairman and CTO. Nowadays he is in the top 10 Forbes (10th place with $58.5B). We all remember that a lot of powerful tech companies emerged in the USA in the late 1970s (Microsoft, Apple, or Sun Microsystems), but Oracle still remains the closest to its entrepreneurship roots. A major contribution to the success of the company and its continuous development has come from its charismatic leader, who runs the company as if it is still a startup. He always stands in the middle of all actions and events, and makes decisions himself, usually without any hearing or intervention of third parties. Moreover, these solutions and decisions cover various issues and fields of activity, from the creation of the design of the advertising company to managers’ hiring and firing. Therefore, employees say that Larry is a classic entrepreneur, who prefers going through all details. It so happens, that initially Larry would assume responsibility for all decisions and solutions, hence he was eager to have the most impact on those very decisions and solutions. Today Oracle is a company with 137,000 employees, while the revenue is about $40B (operating income is about $14B). And even now, when the company (it would be no exaggeration to say) is one of the most prominent and biggest tech firms, you can see a large-format image of Oracle’s current CTO before he comes up on stage. Larry does so because he is a real actor. He loves grandstanding and knows how to implement it, no matter whether there is a vast audience or a small group of people in front of him. Ellison can accept a viewpoint of an interlocutor, only if there is a face-to-face conversation, but of course, it depends on the intellectual level and flexibility of mind of a conversationalist, otherwise (a group of two and more people) you’ll face out-of-the-box acting. Larry merely feels that he has to act, and these performances became the corporate culture of Oracle. Even if he makes a speech on the same topic at different times, there is a high possibility that he would repeat this speech word-for-word. Moreover, it doesn’t matter whether it is a specialized exhibition/summit with an audience of 5000 people (both managers and clients), or just a meeting about the development of a new product, which includes no more than 10 employees. Is that the trick that we can call his success secret? It is hard to say, since Larry Ellison calls innovation the main engine of his, and hence Oracle’s success. But acting tricks undoubtedly help Larry in varying degrees. Plus, the billionaire believes that there is no room for complacency, and he continues to improve himself and Oracle’s products, regardless of their existing achievements. Not long ago Larry claimed that Oracle would become the leading middleware and app-developing company. This seems to be quite an ambitious statement, but if we take a look at all his accomplishments and predictions (about the company’s revenue), this statement no longer looks so fancy and unreal. You’ll buy only our products because we’ve got everything you need – from databases to business apps. Nobody is ever allowed to outshine Larry Ellison. Anyone who has ever tried has been shown the door. Thus, those close to Larry become the first candidates to be thrown away. There were a lot of bright “heirs to the throne”, and they all believed they were worthy ones. However they all ended up similarly, and it is not so difficult to guess how, since Oracle is still chaired by Larry. 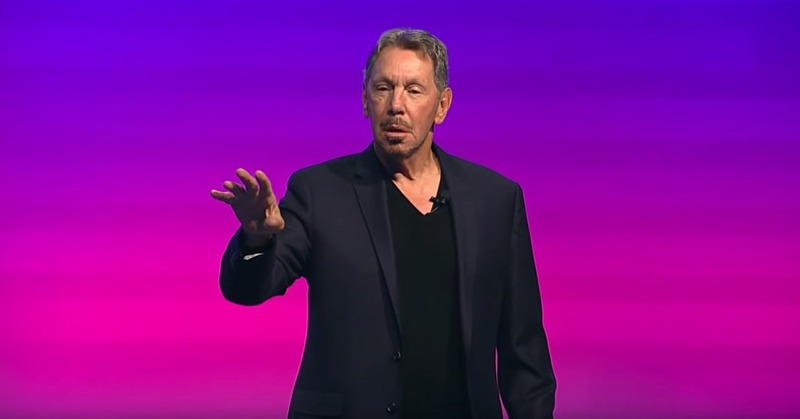 It is almost impossible to find a fan of Oracle’s personality cult, as well as almost half the employees have serious concerns about Larry’s management practices. Nevertheless, no matter how controversial, rough, and ambiguous the working methods of Larry Ellison are, one thing is certain: they always produce the intended results. What about Larry? There is an old Turkish proverb – “The dogs bark, but the caravan goes on”, and it adequately describes the entire situation. He has already hijacked the history of apps and software development, while his Oracle is one of the most successful software companies ever.